Roger Fry (1866-1934) - English painter, art critic and member of the Bloomsbury Group and one of the most influential art critics in the early 20th century, a key thinker who emphasized the formal properties of a work of art. 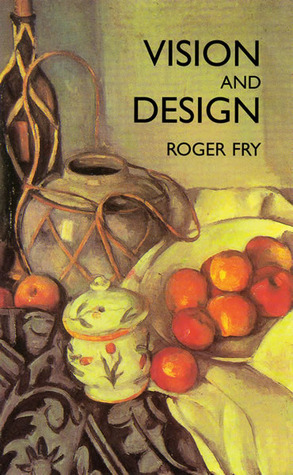 Vision and Design contains over two dozen Roger Fry essays on many topics of art, architecture, design, art theory and art criticism. I especially enjoyed the essays on the art of Albrecht Dürer, William Blake and Aubrey Beardsley. However, above all, I read and reread the author's most well-known work, An Essay in Aesthetics, and it is this essay I will make the focus of my review. Below are direct quotes from the essay itself along with my comments: “That in the actual life the processes of natural selection have brought it about that the instinctive reaction, such, for instance, as flight from danger, shall be the important part of the whole process, and it is towards this that the man bends the whole of his conscious endeavor.” ---------- By “actual life” Roger Fry is referring to our life in the moment – what we see, hear, feel and smell in our immediate surrounding. And if we are threatened in any way, all our focus becomes particularly acute to deal with the danger - for example, if we are in a building and smell smoke or see a fire, we instantly try to escape. “But in the imaginative life no such action is necessary, and therefore, the whole consciousness may be focused upon the perceptive and the emotional aspects of the experience. In this way we get, in the imaginative life, a different set of values, and a different kind of perception.” ---------- If we are viewing a film where actors up on the screen are caught in a building on fire, there’s no need for us to panic or plan our escape; we can sit back in our seats and watch the unfolding drama. Caught up in a horror film, through the play of imagination, an audience can participate in the intense emotions of the actors, but at a safe distance. “In the first place we see the event much more clearly; see a number of quite interesting but irrelevant things, which in real life could not struggle into our consciousness.” ---------- This is the key point for Roger Fry: our “imaginative life” is quite different from our “actual life.” Since our “imaginative life” is not bound by the press of problems and potential dangers in our immediate environment, we can actively pick and choose our focus of attention and engage more creatively with the world. “The frame of the mirror does to some extent turn the reflected scene from one that belongs to our actual life into one that belongs rather to the imaginative life. The frame of the mirror makes its surface into a very rudimentary work of art, since it helps us to attain to the artistic vision.” ---------- Such a vivid example. By looking at a mirror, peering at the world indirectly through its mirror image, we transition from the “active life” to the “imaginative life.” And art, according to Roger Fry, is very much like the mirror, in that it both expresses and stimulates the imaginative life. “The imaginative life comes in the course of time to represent more or less what mankind feels to be the completest expression of its own nature, the freest use of its innate capacities, the actual life may be explained and justified by its approximation here and there, however partially and inadequately, to that freer and fuller life.” ---------- For Fry, It’s the imaginative life that really makes us human – by the play of imagination we are freer and more fully alive. After viewing Van Gogh's Irises, we might see all flowers in a new light. Thus is the power of art and imagination. “Art is the chief organ of the imaginative life; it is by art that it is stimulated and controlled within us, and the imaginative life is distinguished by the greater clearness of its perception, and the greater purity and freedom of its emotion.” --------- The distinction between our “actual life” and our “imaginative life” provides the foundation for Roger Fry’s key observation: When it comes to the freedom and vitality of our imaginative life, art is of critical importance since art prompts us to expand our perceptions and notions of the world and guides us as we expand our vision and hone our thinking. “If, then, an object of any kind is created by man not for use, for its fitness to actual life, what will its qualities be? It must in the first place be adapted to that disinterested intensity of contemplation, which we have found to be the effect of cutting off the responsive action. It must be suited to that heightened power of perception which we found to result therefrom.” ---------- Again, according to Roger Fry, through art and the imaginative life, our senses are refined and we strengthen our ability to contemplate calmly and objectively, that is, to not continually assert our selfish desires. “One chief aspect of order in a work of art is unity; unity of some kind is necessary for our restful contemplation of a work of art as a whole, since if it lacks unity we cannot contemplate it in its entirety, but we shall pass outside it to other things necessary to complete its unity.” ---------- And what are the specific components an artist draws on to achieve unity? Roger Fry lists and describes the following: rhythm of line, mass, space, light and shade as well as color. To delve more deeply into the author’s thinking, An Essay in Aesthetics is available on-line in PDF form by a simple Google search using author name and essay title. Landscape watercolor by artist Qin Yun. Our eye can linger over rhythm of line, mass, space, light and shade, color. "We have admitted that the emotions of the imaginative are generally weaker than those of the actual life. The picture of a saint being slowly flayed alive, revolting as it is, will not produce the same physical sensations of sickening disgust that a modern man would feel if he could assist at the actual event; but they have a compensating clearness of presentment to the consciousness. The more poignant emotions of actual life, I think, have a kind of numbing effect analogous to the paralyzing influence of fear in some animals. ""...some of the more intelligent writers on art recognize that the new idea is really related to past aesthetic expressions which have become recognized. Then a clever artist, without any individual vision of his own, sees the possibility of using a modification of the new idea, and makes an ingenious compromise between it and the old, generally accepted notions of art. The public, which has been irritated by its incomprehension of the new idea, finding the compromise just intelligible, and delighted to find itself cleverer than it thought, acclaims the compromising intermediary as a genius. The process of disinfection thus begun goes on with increasing energy and rapidity, and before long the travesty of the new idea is completely assimilable by the social organism. The public, after swallowing innumerable irritations of the new idea, might even at last reluctantly accept the original creator as a great man, but generally not until he has been dead for some time and has become a vague and mythical figure." Art and Socialism is really useful for answering, 'how can there be art within socialism' The French Post Impressionists has some awesome things to say about what "classical" means. Roger Fry - Roger Eliot Fry was an English artist and art critic, and a member of the Bloomsbury Group. Establishing his reputation as a scholar of the Old Masters, he became an advocate of more recent developments in French painting, to which he gave the name Post-Impressionism. He was the first figure to raise public awareness of modern art in Britain, and emphasized the formal properties of paintings over the "associated ideas" conjured in the viewer by their depicted content. He was described by the art historian Kenneth Clark as "incomparably the greatest influence on taste since Ruskin In so far as taste can be changed by one man, it was changed by Roger Fry".